It is a great pleasure have you visiting our website. My name is Nurullah Çinar and I am the Owner/Captain of the M/S LADES . It has been a long dream of mine to get involved with yachting which I love. After my four decades of background in Tourism now I am proud to present you my boat LADES . Yachting in Turkey is a great way to spend a vacation, especially in azure waters of the Turkish Mediterranean coast. If you have any question or concerns, please contact me at Blue Cruise Bodrum without any hesitation. I look forward to be your private captain soon. This traditional AynaKetch Gulet of 17 meters (54 feet) a Gulet yacht ('GULET' is the name for the typical Turkish wooden motor and sailing yacht), furnished with three double accupancy private guest cabins with double bed. Each of the cabin has its own hand held shower & WC. The yacht is fully outfitted for relaxed cruising for up to 4 adults. Sun bathing deck, dining kitchen area gives us honour to serve you as our guest. For lovers of the active life, cruising with the M/S LADES in Mediterranean's turquoise waters, provides great opportunities for swimming, fishing and diving. M/S LADES is located in GOCEK near Fethiye (Mugla province) at the heart of Turkish Mediterranean cost and offering you different enjoyment plans for sailing pleasure. 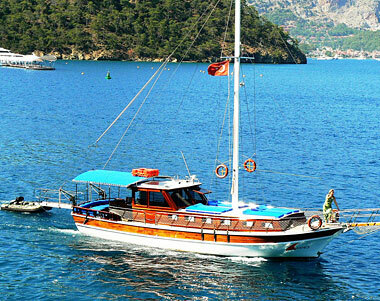 Cruising holiday by aboarding a 'Gulet' appeals to all age of people. It can be as relaxing or as energetic an experience as desired. One day you may decide stay on board to read a book, while sipping your favorite drink and sun bathing on deck. Or in a more active day, you may include windsurfing, fishing or when the yacht is anchored in a beautiful cove, hiking in the woods or enjoy all day swimming and snorkeling. Also while your yacht is docked you may wish to spend your day by touring a nearby ancient city or have a special shore evening in neigbory town or in a Turkish village. There is no doubt that M/S LADES offers you fantastic vacation with charter a private tour. Our 2013 cruising season starts in April through October. and we are extremely excited! Booking early in the season will give you the best choice for guaranting your crusing holiday. In Private Gulet Charters, the gulet is rented privately. There is no fixed itinerary and it is possible to board or leave the yacht in any harbour, such as Marmaris, Göcek or Fethiye. Prices change depending on duration and the month. The M/S LADES meets international safety regulations including life jackets, fire extinguishers and alarms.